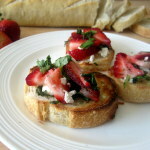 Gorgeous roasted strawberries paired with creamy goat cheese and fresh basil on top of crispy crostini. 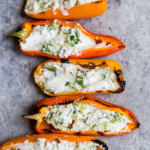 An incredible summer appetizer that’s perfect for entertaining! We’re already in the middle of summer and I feel like time is flying. Anyone else? I forget how fast it goes when each week brings something different and the sun stays out till 9PM. I’m so lucky to be spending this summer traveling, spending time with people I love, and of course cooking and eating delicious food. While we near August I’m excited to keep experimenting with more fresh summer produce (o.m.g. did you catch that peach crisp on my Instagram stories this weekend?) and getting together with more friends and family. What’s better than cooking for your favorite people? To me…nothing! This week we had the pleasure of trying out this gorgeous appetizer from my friend Kathryne‘s new cookbook: Love Real Food. You probably know Kathryne as Kate from Cookie + Kate, and believe me when I tell you she has made some magic in this book. All of the recipes are vegetarian, super creative, and cooked with delicious, fresh ingredients (I literally “ooh” and “ahh” when I flip through the gorgeous pages). Kathryne includes everything from soups and salads to incredible pizzas, and even a whole section called Happy Hour. Ummmm can I get a HELL YES?! 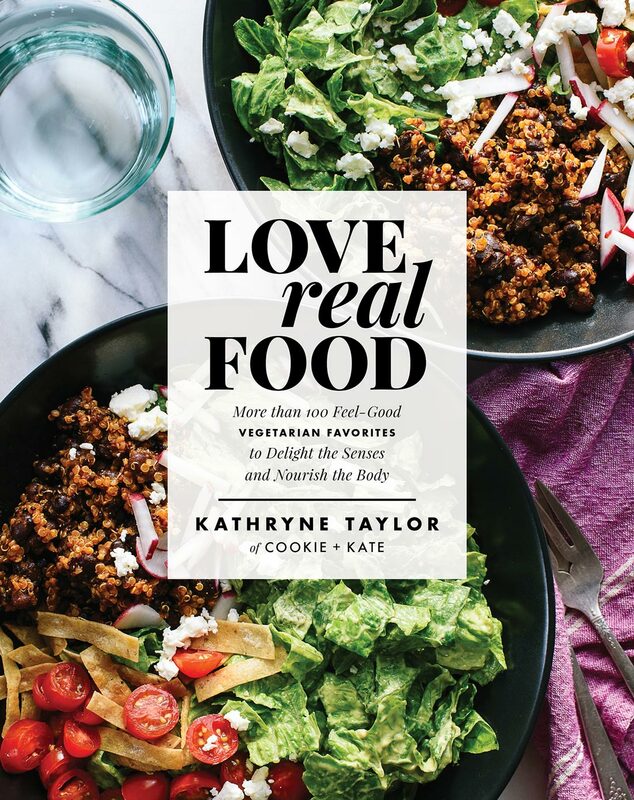 One of my favorite parts about the book is the beginning, where Kathryne guides readers on eating whole foods, reading nutrition labels, foods that are dangerous to dogs (like her adorable pup, Cookie) and basic flavor boosters while cooking. These little tips and tricks are so helpful – whether you consider yourself a beginner in the kitchen or an ol’ pro. Can you guess which section Abra and I flipped to when picking a recipe? That’s right – happy hour baby! 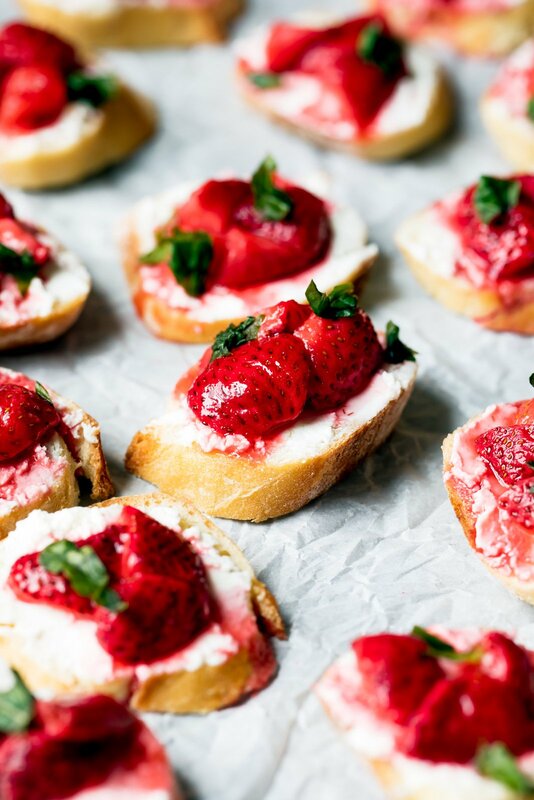 We whipped up these Roasted Strawberry, Basil, and Goat Cheese Crostini and not only are they freaking amazing, but they’re also perfect for serving up at your next get-together. 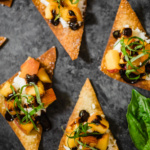 The flavors on these cute little crostini have the perfect amount of sweetness – not overpowering, and paired well with the freshness of the basil and creaminess of the goat cheese. I absolutely LOVE this recipe because it’s the perfect balance of simplicity and sophistication. AKA I can whip these up with a few simple ingredients and feel a lil fancy at the same time. Beautiful, ripe strawberries are tossed in a little honey before they’re popped into the oven, and the simple combo smells SO GOOD. They get super tender and the juice is gorgeous for drizzling over the crispy toasts. Be sure to pick up your own copy of Kathryne’s cookbook here, grab your friends, and enjoy! Because that’s what summer is all about. 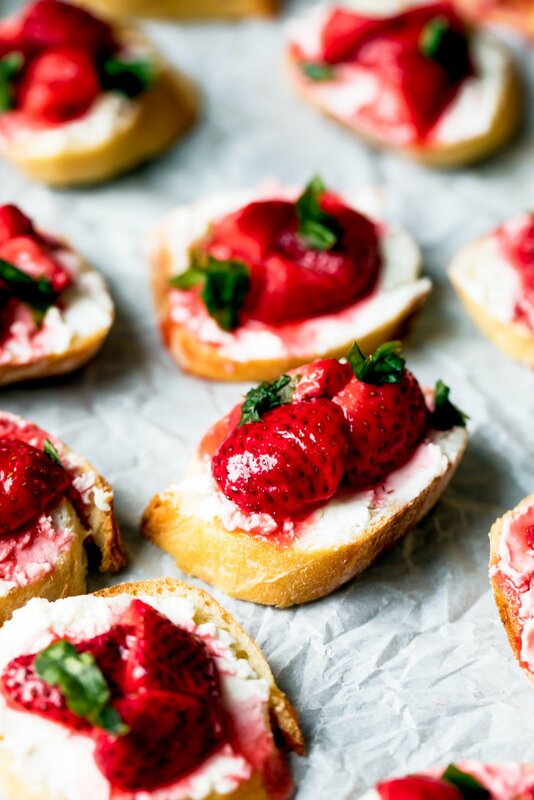 Gorgeous roasted strawberries paired with creamy goat cheese and fresh basil on top of crispy crostini. 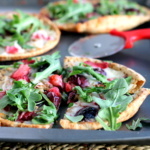 And incredible summertime appetizer that's perfect for entertaining! Preheat the oven to 350 degrees F with racks in the middle and upper third of the oven. Line two large rimmed baking sheets with parchment paper for easier cleanup. Set the goat cheese on the counter to soften up a bit. On one baking sheet, toss the strawberries with the honey, then spread the strawberries into a single layer. Bake on the upper rack until the fruit is tender, juicy, and collapses on itself, 20 to 25 minutes, tossing halfway. Watch the fruit on the edges of the pan, as the honey can burn quickly. Meanwhile, on the remaining baking sheet, brush the olive oil lightly over both sides of each slice of bread. Bake on the middle rack until the toasts are golden on top, 10 to 12 minutes. Once the toasts are cool enough to safely handle, top each one with a smear of goat cheese, followed by a spoonful of roasted strawberries and their juices. Finish off the crostini with a sprinkling of torn basil and black pepper. Crostini are best served immediately. 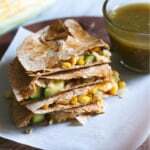 This recipe is reprinted with permission from Love Real Food. 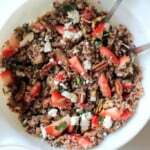 16 Responses to "Roasted Strawberry, Basil, and Goat Cheese Crostini from Love Real Food"
Everything I’ve made from her cookbook has been phenomenal! Amazing! Such great recipes in there. OMG! That looks amazing, we are in winter here and strawberries are plentiful, I will definitely give this a go. I don’t think I have ever had strawberries with basil before. I hope I am not missing out. It is so, so good! The basil combo is fabulous and something new to try 🙂 Enjoy! Her cook book was one of the best released this spring!!! LOVE IT! And those 5 minute grain-free peanut butter chocolate cookies are dangerously easy! It looks delicious. I have to try it now. Thank you. Wow, Dish seems to be delicious. For sure i am going to try it . Thanks for great share. I made these as part of our dinner – don’t want summer to end, so I will eat “summer” food as long as I can. It was really delicious, the strawberry flavor was so intense. Yum!